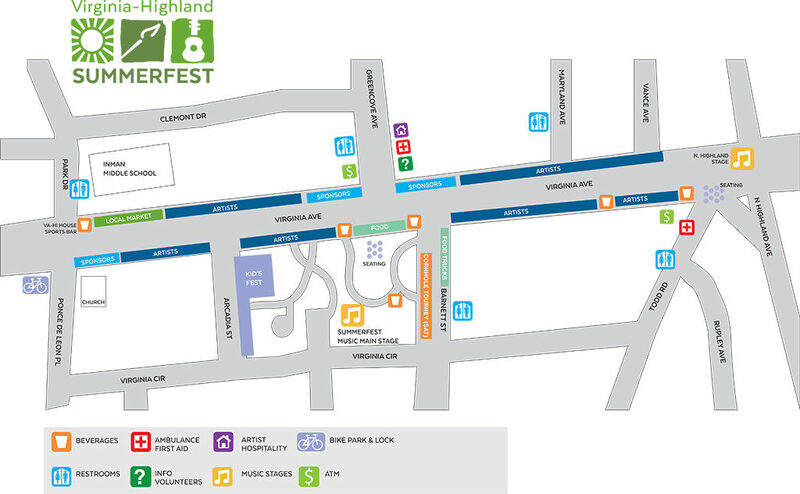 Summerfest is located on scenic and historic Virginia Avenue between North Highland Avenue and Park Drive. The 5K race begins at the eastern end of the festival just one block east of the intersection of Virginia and North Highland. A bike valet will be available on Saturday 10 a.m. – 8:30 p.m. and Sunday 10 a.m. – 6 p.m.
Use Google Maps or Bing Maps for turn-by-turn directions from your location. Use “Virginia Avenue at N. Highland Avenue 30306” as the destination for the festival (eastern end) or “Park Drive at Virginia Avenue 30306” for the western end. Festival attendees can park for $10 at the church lot below, during times indicated. Grace Lutheran Church: 1155 North Highland Ave.
Saturday, starting at 9 a.m.
Sunday, starting after church services at 1 p.m. This church is within easy walking distance of the festival. Roll-the-dice – There is a limited mix of free parking lots, paid parking lots, and designated on-street parking (including handicap street spaces). 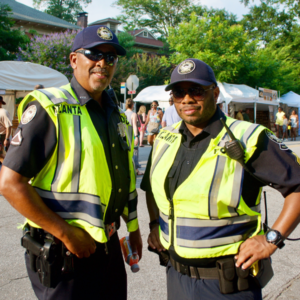 Beware that parking is always tight for Summerfest.Police will be enforcing standard parking rules and regulations and special event restrictions which will be posted on affected streets. Whom Should I Contact with Questions About Summerfest? Festival Sponsors: Please email questions about becoming a sponsor to rick@mixitmarketing.com. News and Media Inquiries: Please contact Andi Frey or Carrie Whitney at Launch Atlanta. Food Vendors: Please email questions about becoming a food vendor to Premier Events Management. Music and Entertainment: Please do not solicit us for music or walking/street entertainment. We have that covered and regrettably,simply do not have the time to respond to requests about becoming a music act or providing walking/street entertainment. We get wet. Summerfest goes on rain or shine. Certain events such as the live music may be suspended depending on the intensity of the rain. Can I Bring My Dog (Or Other Pet) To Summerfest? Just a reminder that City ordinance prohibits pets at Summerfest. If you’re in a pinch, we know just the right people to keep an eye on them while you’re out enjoying yourself!Only exception: you and your certified service dog are welcome at Summerfest. What Forms of Payment Are Accepted For Things I Want To Buy At Summerfest? Drinks may be purchased by credit card. Otherwise, payment terms are determined by each vendor. As a practical matter, most artists accept Visa, MasterCard, and Amex in addition to good ole cash. Most food vendors accept only cash. ATMs are conveniently located near Summerfest. What Should I Not Bring Into Summerfest? Alcohol, Illegal Weapons, Pets, Bicycles (o.k. to valet or lock-up outside festival), Skates, Skateboards, Scooters, Oversized Backpacks, Picnic Coolers, Folding Chairs, Grills, Illegal Substances or anything else the police at the entrances may deem not in the best interests of Summerfest. All bags are subject to search by the Atlanta Police Department. Are Alcoholic Drinks Available At Summerfest? You betcha! Authorized vendors will be selling beer and mixed drinks to those 21 and over on Friday, Saturday and Sunday. Summerfestorganizers urge guests to drink responsibly. Summerfest is the annual fundraiser for the Virginia-Highland Civic Association, Inc. (“VHCA”), a volunteer-run, non-profit organization that helps maintain Virginia-Highland as one of the most livable urban communities in America. The VHCA leads and supports zoning and planning initiatives and other neighborhood improvements (ex: recentOrme Park and John Howell Park renovations and purchase/construction of North Highland Park, new trees, graffiti eradication, and street captain crime prevention programs). The VHCA also provides financial support to local parks, schools, public library, Trees Atlanta, and other organizations serving Virginia-Highland residents.